A short, witty, engaging and faithful book showing how the surprising meaning of the first Christmas gives us what we are all seeking—a real joy that really lasts. Do you look forward to getting to Christmas to give you a lift, or just aim to get through Christmas, without any family arguments? Often, we're so busy getting to or getting through that we don't actually get Christmas—and when we miss its meaning, we miss out on a joy that lasts. This book takes you on a journey to find a joy that continues through the ups and downs of life—and beyond. Perfect for giving away at Christmas services, or to non-believing friends and family. Bulk discounts available. We can produce a matching flyer for advertising your Christmas services. Simply email overprinting@thegoodbook.co.uk with your details and the number of flyers you need (minimum order 500). Prices can be found here. Here's the full resource package to help you plan a whole Christmas campaign around the search for joy that lasts, including a download of the engaging penguin video on this page. Scroll to the end of the blog piece to get all the assets. For those of us, who in a corner of our hearts, retain a child-like joy at the prospect of Christmas, this book unpacks that joy's permanent source. It's all about understanding what the gold, frankincense and myrrh really mean. Do you? If not, read on and rejoice. Christmas is a unique opportunity to sing and share the gospel with people, because it is the time of year when people think about their lives. 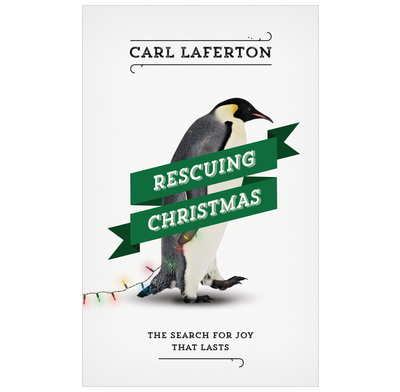 Rescuing Christmas is a wonderful way to do that—a fascinating book by a great writer. Pastors, buy this book to give away to your congregation and to your community. Hymnwriter; founder of Getty Music; author of Sing! This fresh retelling of the "three kings" will surprise, inform and engage you. Let it draw you to the original Christmas gift. Probably the most accessible outreach material that we've used in a long time and heartily recommend.it. We gave a copy of this to every member of our Home Group and also some copies to give out in church. Carl Laferton has humour and truth and honesty in his writing;. the responses we have had show that it has struck a chord with a wide range of people. I agree with previous review, it would be great to give out at the end of carol services. This is a good resource to buy for people who are interested in Christianity. Maybe if people have shown an interest by doing a course or coming to a few evangelistic events. They'd need to be interested enough to read a short book, but I think if they're willing it would be a really easy read for them and clearly points them to the only Saviour, King Jesus. It would be worth having some for people to take away after a carol service, too.